The electoral college discriminates against smaller parties participating in the selection of the President, perpetuating a two-party system. The EC grants 1 vote per elector, and requires a majority to determine a winner. This is known as First Past the Post election. Apprehension to handing the election over to the House of Representatives if a majority is not achieved naturally drives voters to limiting elections choices. 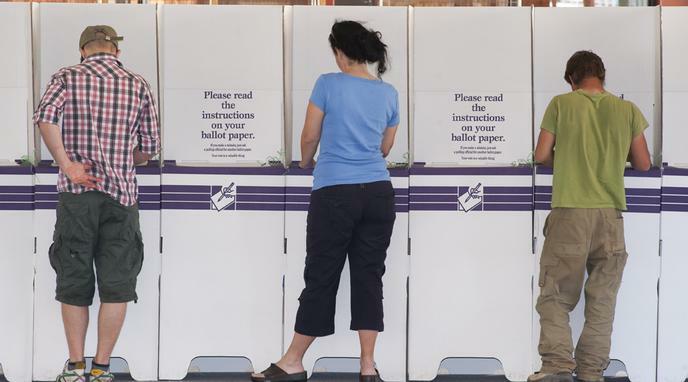 A liberal is more likely to choose an inferior candidate to ensure 'some' liberal is elected. Adopting an alternative like Run-Off voting with direct election is the only way to expand choices. FPTP (which perpetuates a two party system) is employed by the electoral college. It is used both on the national level for counting EC votes, and on the state level (in almost all states) for determining the allocation of a state's EC votes. site calculates that, if various proportional allocation methods were used, 3rd party candidates would have received more electoral votes than they did. These various options also all produce a closer result and better match state voting. The electoral college does not discriminate based on political party, but on location. Third parties require a popular vote of plus or minus 10% to be recognized as valid for participation. This goal is not hindered by the EC. This is also true of representative districts (winner take all) and many other aspects of the voting system. This is not an argument against the electoral college so much as it as an argument for a parliamentary system, which is a whole different sort of change than is it issue here. Other features of American politics cause the entrenchment of the two-party system, not the electoral college. A two-party system is not inherently bad.